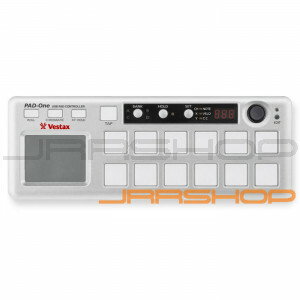 The Vestax PAD-One is a solid robust MIDI pad controller, compatible with various DJ & DAW software and can be used to control any kind of MIDI device, including synthesizers, samplers, drum machines, and electronic drums. The aluminum chassis will never warp or crack, ensuring you long life durability and stability. The PAD-One can individually assign pads on the fly, and shows you each pads MIDI value on the 7seg indicator. Compact, solid and reliable, the PAD One is the ideal item to your DJ arsenal.